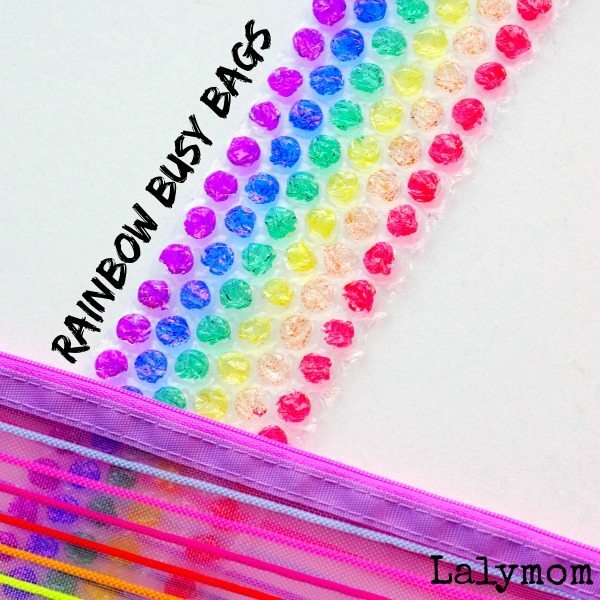 Welcome back to the Busy Bags Blog hop, a monthly themed blog hop to bring you fun, easy ideas to keep kids busy. 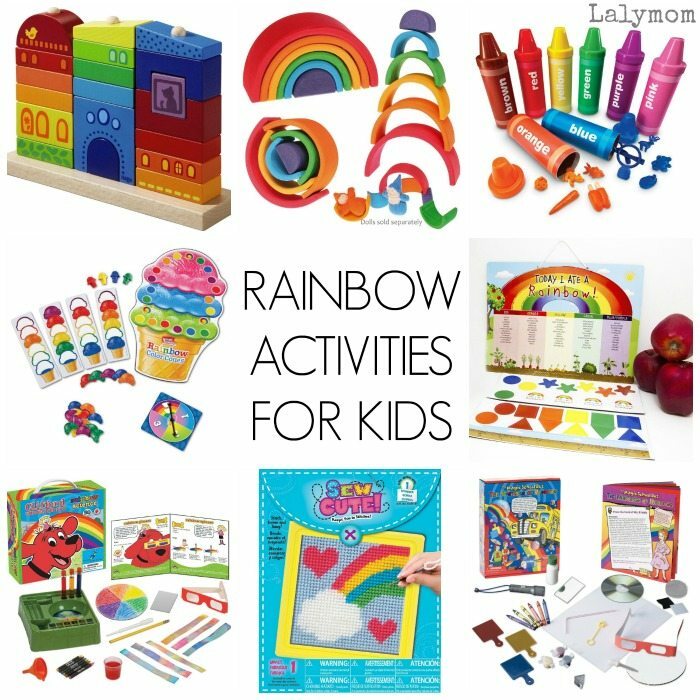 Today it is all about Rainbow Activities! Busy bags are meant to be simple activities you can put together into bags or boxes and just grab one when your child could use something to keep him or her busy…hence the name- Busy Bags! 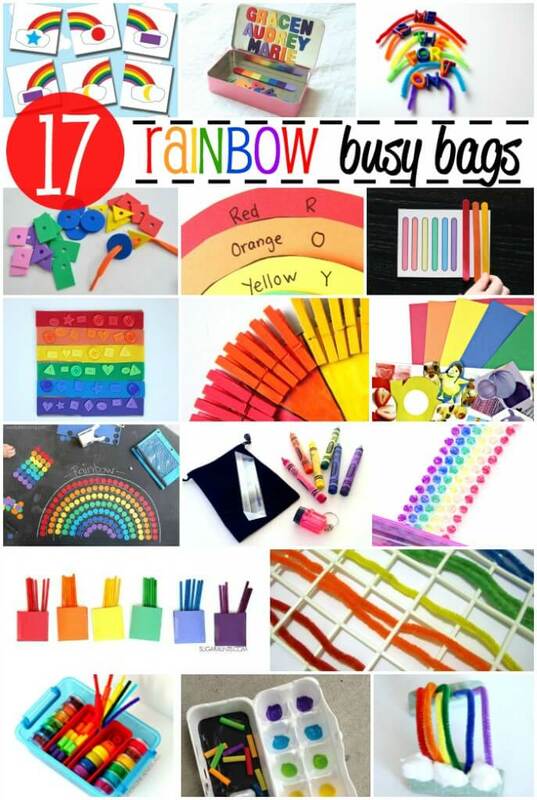 This month since St. Patrick's Day is around the corner we chose to create busy bags with a Rainbow theme! And look how vibrant and happy they all came out! My answer: Know your kids and supervise them as needed with ANY activity and ANY material. My 4.5 year old daughter could have been trusted with this activity a year ago, easily. I don't know if the same will be true of my son, he is much more mischievous. You'll know if your kids are ready, and maybe it is something that a younger child can do at the table while an older child does homework. My 4.5 year old loved completing the pattern and was quite quietly busy with her bubble wrap for some time. I did a long strip of this myself and I found the small, intricate motions to be kind of calming and mesmerizing. We both did! Filling in the bubbles takes concentration and a careful hand but was not difficult for my preschooler to tackle. We did this activity while my 2.5 year old was sleeping so the marker had dried for a while when we showed it to him. They both loved popping the bubbles of course, and it turned into a fantastically fun color activity for my son. I actually love how it turned from an activity to keep my preschooler busy into one that she made that kept my toddler busy! Cut a long strip of bubble wrap 6-7 bubbles wide (again, we only had one blue/indigo sharpie, so ours is only 6 but if you have a light blue and dark blue, cut 7). 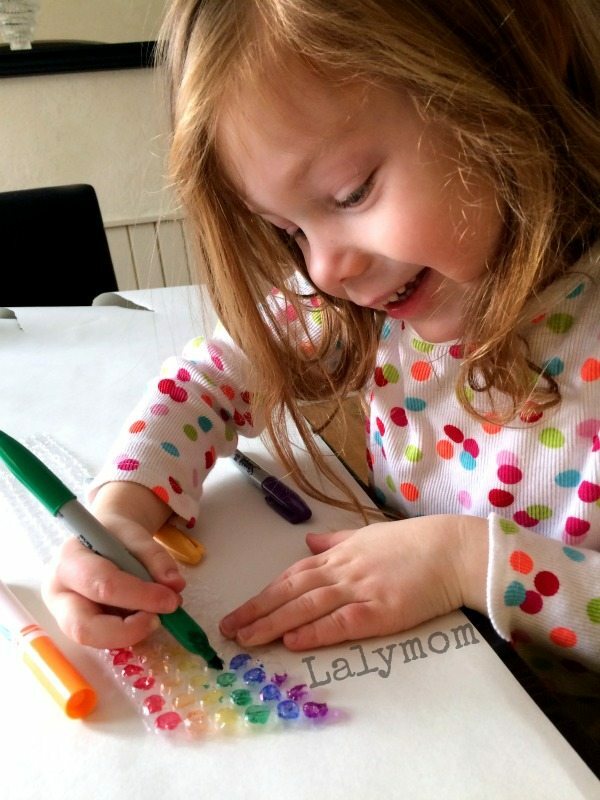 Use the sharpie markers to color the first bubble of each row in the ROY G BIV order. Place the markers and the strip of bubble wrap into the zipper bag. 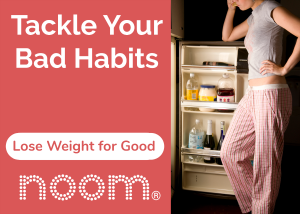 -Your child can complete the pattern along all the bubbles. 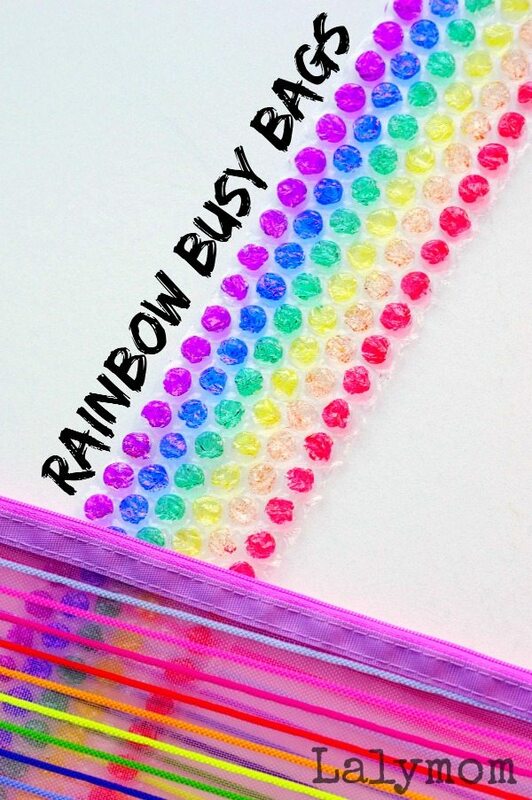 Hang it in the window as a rainbow suncatcher! Click the links below to see full product details on Amazon. This is genius!! I never thought to actually color bubble wrap. 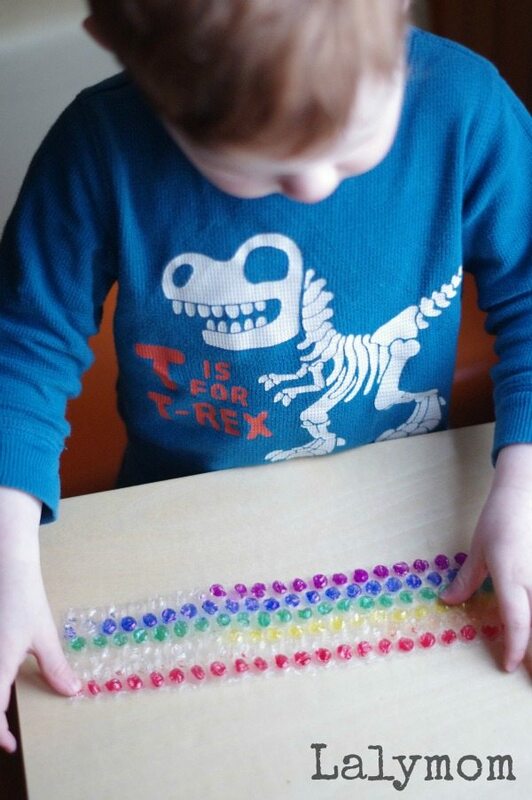 Such a clever way to work on fine motor skills. Love it. 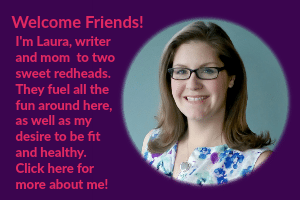 OMG Thank you for the kind words! 🙂 Hehe my kids have requested this one a few times since we first did it! Malia took the words right out of my mouth (errr keyboard). This is so brilliant!!! I can’t wait to do this with my little ones because we LOVE permanent markers ;).